This unique ability to make something special out of the ordinary stayed with him for life. Blide grew up in the small, rural town of Afton, Minnesota. He learned to work with machines on local farms, rode tractors at a neighbor’s and had an influential ninth grade industrial arts teacher who insisted that he master everything he learned, which included welding. 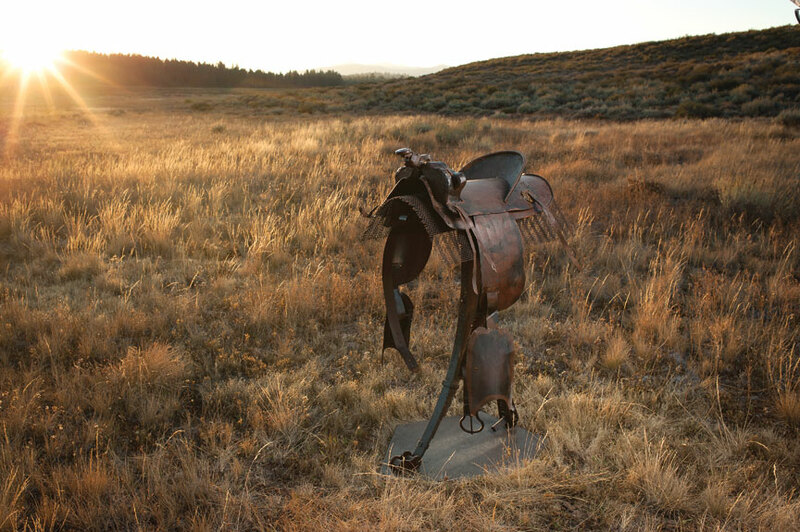 In the early 2000s, Blide started Wild Hair Welding as a hobby, creating sculptures out of mostly found materials. Just as he’d turn rocks into ladybugs as a child, Blide would search around railroad tracks and farmlands for “junk”—spikes, washers, gears, pipes and bolts—that he could turn into art. Many of his sculptures are inspired by events of his own life—horses and saddles recollect his rural childhood, airplanes hark back to his time as a mechanic—but Blide is perhaps best known for his “Spike Men.” Each Spike person is created by welding together seven railroad spikes—two for each of the legs, one for the torso and one per arm—and topped with a lock washer for the head. With these basics, Blide can make his Spike Men do just about anything—ski, cycle, play instruments, garden. Blide uses hammer and anvil to bend and form the pieces that make up his Spike Men. When he’s ready to assemble a Spike Man, he begins by tack welding the first piece—usually the leg—to a table. Tack welding is a form of intermittent welding that holds the metal in place while Blide puts the sculpture together. He likens it to a glue gun. “It’s metal that comes out of a gun,” he says. “You put it together with one dot of glue, and when you like it, you go back and glue it all together again.” If a sculpture isn’t coming together the way he imagined, he can easily dismantle the pieces and start anew. Pat officially joined Riverside Studios in October, 2013.